Aflatoon is only sweet in Bangladesh which needs to bake. It’s literally cake like sweet made with mawa, ghee, sugar, semolina and nutmeg (sometimes dry fruits raisin and pistachio). Instead of mawa I used milk powder here to make easier. Pure ghee is must ingredient here which gives lots of flavour. Another key point is beat the batter to make really smooth. For Eggs please make sure that 2 eggs will be half cup . Please don’t over beat the batter, just it does not have any lump. Also need loaf pan and extra ghee/ butter to grease the pan. Preheat the oven 160 degree c and grease the pan with ghee/ butter. Beat eggs and sugar together till sugar dissolve. Add rest of ingredients one by one and make smooth batter. Pour into loaf pan and bake about 35 minutes till it becomes dark brown on top. 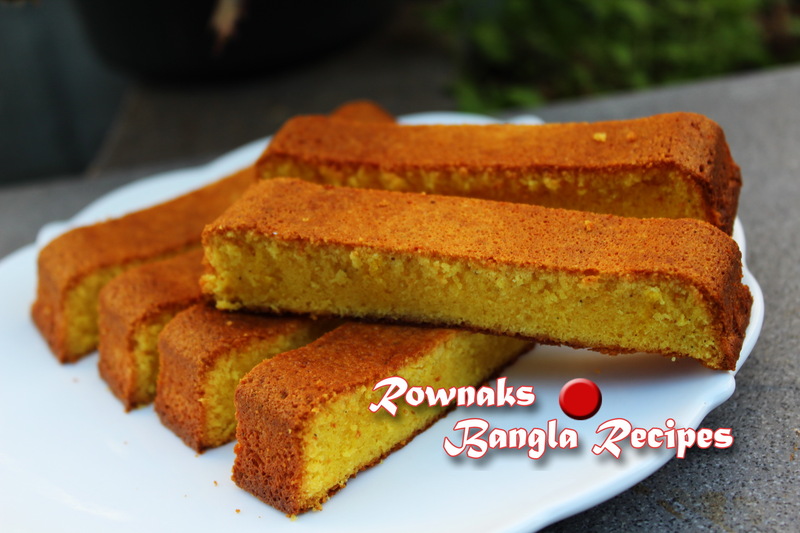 Cut Aflatoon into rectangle shape and add sweetness in your life. You can wrap Aflatoon with paper like shop. don’t over beat the batter, just it does not have any lump. If your Aflatoon is getting dark, cover top with aluminium foil. Whatever easier for you. need to mix well though..
Apu, jaifol powder na dile ki problem hobe? apu etar bake korar pore fule unshaped hoye jai, ki korbo? 2cup suji r jonno poriman kmon hobey? Asholey egg koita dibo buztey parchina…2cup e.
Apu aflatoont ki chulay kora shombhov pressure cooker die? Because I don’t have oven.